Home > Memberships & Services > Memberships & Subscriptions Catalog > Societies > IEEE Engineering in Medicine and Biology Society Memb.. The EMBS field of interest is the development and application of engineering concepts and methods to biology, medicine and health sciences to provide effective solutions to biological, medical and healthcare problems. The field encompasses the development of mathematical theories, physical, biological and chemical principles, computational models and algorithms, devices and systems for clinical, industrial and educational applications. The society sponsors the EMBS Annual International Conference. If you wish to purchase additional copies of publications included in your membership, please contact www.ieee.org/contactcenter. Membership includes the Essential Package. 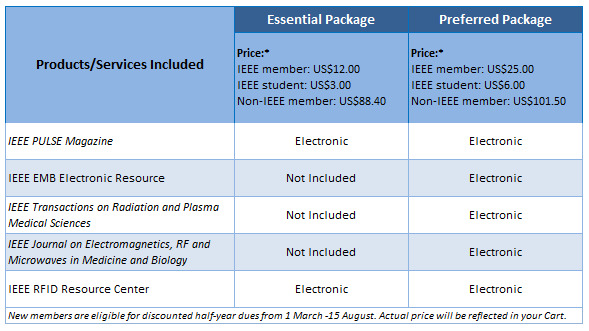 To select the Preferred Package, select 'Customize Options' in your cart at checkout and add IEEE EMB Electronic Resource, IEEE Transactions on Radiation and Plasma Medical Sciences (electronic), IEEE Journal on Electromagnetics, RF, and Microwaves in Medicine and Biology (electronic), and IEEE RFID Virtual Journal (electronic) for an additional US$7.50 for members or US$2.50 for students.